If you already use Colon Corrective™, you can skip the following steps and start right in on Day 1. Start capsules. It is recommended to start with the Colon Corrective™ capsules first. Take one capsule with dinner. If you don't feel movement by the morning, then the next night, take two with dinner and increase by 1 each night until the bowels are moving well. For some people, it can take a few days to get the colon moving, for others it can be very quick. Remember, it has taken most of us years to create a sluggish bowel; so let's be patient for a few days and increase our dosage of Colon Corrective by just one capsule a day -- only. Continue Colon Corrective™ capsules till you have colon movement. It is important to have at least one significant bowel movement a day while doing the colon cleanse as the powder can tend to be binding. It can be taken at a different meal if you wish, just try and be consistent with taking it around the same time each day. For most people, taking the capsules at dinner will stimulate a movement the following morning upon rising. Adjust the amount of capsules as needed so that the timing of movements is convenient for you. Start taking the Colon Regenerator™ powder. One scoop a day on an empty stomach. It is best to follow the Daily Colon Detox recipe, where you mix 8 ounces of diluted juice and one scoop detox powder, shake well till lumps are gone, and drink quickly before it thickens. Rinse the bottle and reuse as required. It is helpful to drink additional liquid after each dose of Colon Regenerator™ (at least 8 ounces). Be sure and drink plenty of pure water, herb teas, and diluted fruit and vegetable juices during the Intestinal Cleansing. A good amount is 64-128 ounces of liquid a day. This makes the program more effective. Start Metal Magic™ if combining Detox 1 & 2 (these two detoxes are Phase 1). The instructions are to use 4 droppers, 3 times a day until the bottle is gone. (One "dropper" equals 1 ml, as marked on the dropper. It can be difficult to see because the liquid is so dark.) It can be taken with diluted juice or water -- with or without food. As with medication, do not take Metal Magic™ at the same time as the Colon Regenerator™--or the detox powder will absorb the herbs and flush them out the body. Continue Colon Regenerator™ Powder until gone. Also, be sure to continue taking the Colon Corrective all the way through the detox, when your Colon Regenerator™ powder is finished. If you feel at all constipated during the detox, you can increase your dosage of Colon Corrective as much as necessary. At the end of the detox, wean off the Corrective slowly — reducing the amount you take by one capsule every couple of days. Still have more questions? Review our Colon Detox frequently asked questions. Taking medications? Be sure to take any other supplements (including the Metal Magic and Colon Corrective) or medications a minimum of 20 minutes before or an hour after the Colon Regenerator™ powder so that there is no chance of them being absorbed. After taking the powder, it is best to wait at least 30 minutes before eating. Accelerated 6-Day Colon Detox Method -- Advanced Detoxers Only!! This is another option for doing the colon detox. It is intensive and not recommended if this is your first time detoxing the colon. As with the 30-day colon detox, find the level of Colon Corrective that works for you (see instructions above), but with one difference. Once you find the daily level that works for you, you will want to increase it by one capsule while doing the accelerated detox. Days 1-6 Either half an hour before breakfast or one hour after a light breakfast, take 1 level scoop of Colon Regenerator™ with at least 8 oz of diluted juice. (Again, it is best to follow the Daily Colon Detox recipe. ) Repeat 1/2 hour before lunch, a couple of hours after lunch, 1/2 hour before dinner, and 1 hour before bed -- for a total of 5 scoops a day. Note: there are approximately 30 scoops of detox powder in the canister--depending on how accurately you fill the scoop. That means, that at 5-scoops a day, it will take you approximately 6 days to complete the accelerated detox. If you feel at all constipated during the detox, you can increase your dosage of Colon Corrective as much as necessary. It is helpful to drink additional liquid after each dose of Colon Regenerator™ (at least 8 ounces). Also, be sure and drink plenty of pure water, herb teas, and diluted fruit and vegetable juices during this 6 Day Intestinal Cleansing and Detoxification program. A good amount is 64-128 ounces of liquid a day. This makes the program more effective. When you've finished the Intestinal Cleansing and Detoxification program, it is time to go on intestinal maintenance. Take 3 tbs. of organic flax seed ground up and mixed with juice on a daily basis to help heal your intestinal tract and to provide your daily fiber needs. It is also recommended that you start using a good probiotic formula on a daily basis to maintain proper intestinal flora. In an ideal world, we would never have to clean and detoxify our colons again. Unfortunately, the same lifestyle that caused the problem in the first place will eventually cause it again. As a preventative therapy, it makes sense to redo the 2-week Intestinal Cleansing and Detoxification program twice a year along with daily use of ground flax seed (or psyllium) and a good probiotic. Regular use of this program will help keep your body in optimal health and vital for as long as you live. A bit confused and frustrated because I've read the book and this day by day schedule, but still not clear on if I'm doing the detox correctly. Is there a comprehensive pamphlet to guide through the entire detox process? I'm on the 2nd week of intestinal detox and now realizing I was already supposed to order probiotics by now and should have been consuming flaxseed throughout colon detox? Thanks in advance for some additional guidance, trying to do this safely and correctly but feel like tracking down all the information piece mail through the website. You were doing everything correct. The section you just read is for colon maintenance only after the detox (for both the normal 30 day or the 2 week accelearted version.) Hope that helps! What kind of diet should we be on during this 2 weeks? Can we still eat protein? Have you checked out our FAQ and Tips section? You can find your answers there. Also, it sounds like you have never done our colon detox before. If so, we highly recommend the slower 30 day cleanse than trying to do the advanced 2 week cleanse. That way you can adjust your diet to what works for you, as well the amount of Colon Corrective™ capsules you need each day. 6-7 years a go you had a much easier format that could be printed out. Do you still have this one available? Looking all over for the diet, when, where, and what, is time consuming. I liked the other instructions better. If they are still available, please mail them to me. Are you talking about the chart for the liver detox? Click on that link. You are in the colon detox section. Clarification on comment posted earlier today: I just noticed the accelerated colon detox takes place over 6 days, not 10. I don't have any irregularity--go about 2 or 3 times per day. Is there any portion of this that I could/should skip then? i am wondering which parts of these cleanses can i eat water based foods like cucumber and watermelon or do i have to strictly drink fruit/vegetable juices? Can you take colon corrector on a regular daily basis along with fiber and probiotics? "There is no problem with continuing to use Colon Corrective indefinitely, even after finishing the Intestinal Cleanse." I am so excited to get started on using Baseline Products this year for my full body cleanse! I detox regularly and am looking forward to following all seasonal phases. 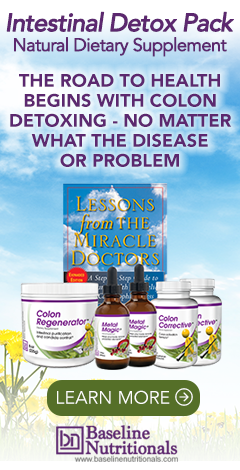 Question about the "Accelerated 6-Day Colon Detox Method": When is it recommended during the day to take Metal Magic since I'll be taking Color Regenerator 5 x/ day? I understand that these two supplements should be taken separate from one another. What about food? For a month I cannot eat anything but drinking and taking supplements if I want to detox my body? I checked everything and I don't see recipes for meals;/. Be sure to check out our FAQ and Tips sections for each detox. There you will find: "Even though there are no diet restrictions on the colon detox, stick with a healthy diet with lots of fresh fruits and vegetables." Thank God for Jon Barron! This is for those who want more information. "This is my life, I am the one responsible for it!" I read "all" information available, then apply some good-old common-sense. While detoxing, my diet stays very close to raw foods; it just makes sense. We cannot heal a "living body" with dead - processed - foods, or foods treated with chemicals. So don't even acknowledge them during the detox. Also, everyone's life style and physiological traits are different; therefore, listen to your body - if you get a feeling of uncomfortable or uneasiness, stay clear of that food - for now. Our bodies do talk to us, if we listen. I am confused. I read all the tip/faqs , instructions. I am not sure if I take the COLON REGENERATOR once a day OR three times a day? Also, should I stop taking the probiotics while on the colon detox? Please contact customer support at Baseline Nutritionals for product questions: [email protected]. Or, call (800) 440-3120. Monday through Friday, 9:00 am - 4:00 pm PST.